by Jill Feldkamp. Source FCNA News, Volume 2, Number 3, Fall 2003, p. 4. Frogs, like many other animals, persist in the Campus Natural Areas (CNA), despite the small size of the CNA. Frogs face threats in the CNA at all stages of life: egg, tadpole, and frog. 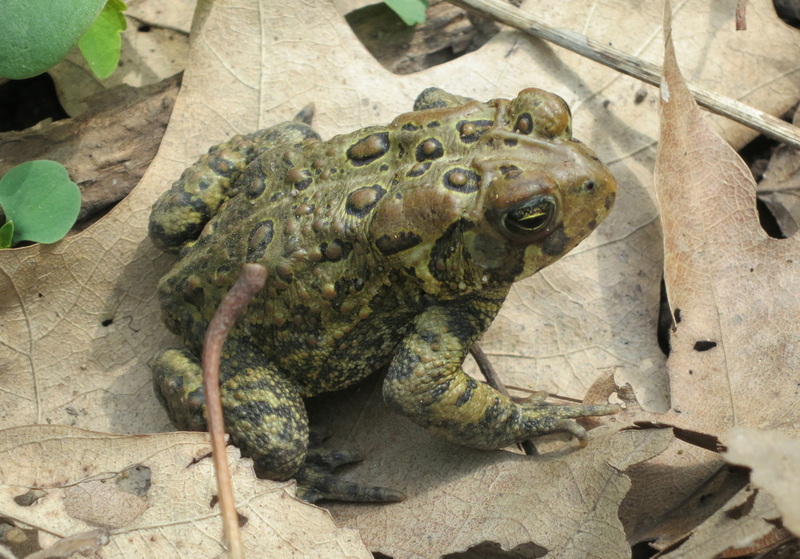 Northern leopard frogs and green frogs are the species most likely to be seen in the CNA. Perhaps there are still some chorus frogs, too, although there is little suitable natural open upland habitat left for them in the CNA because the adjoining land is mowed playing fields and paths. 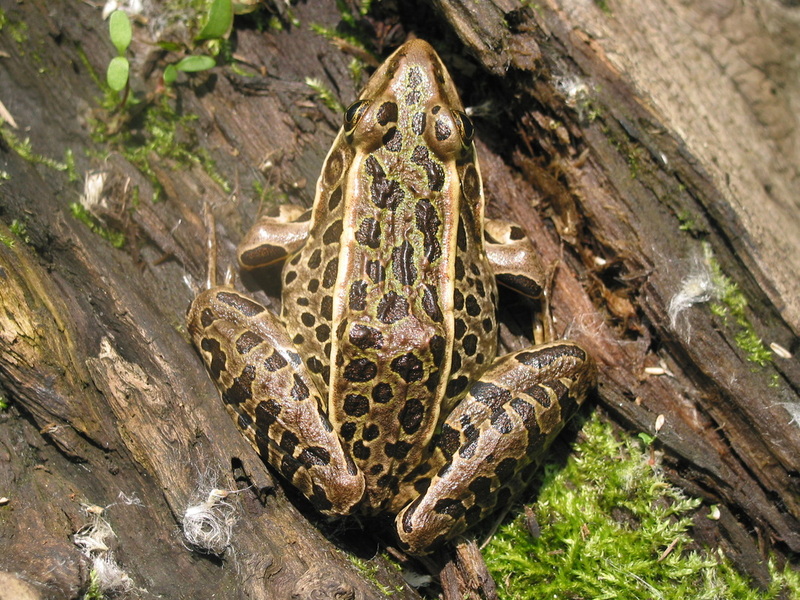 A slender brown or green frog, the northern leopard frog is 2 to 5 inches long and has large, light-edged dark spots and ridges at the junction of the sides and back. Green frogs, as expected, are green, but may also be bronze or brown. Their bellies are white with some lines or spots, and they have large external eardrums. They won’t grow to more than four inches. Chorus frogs are the tiniest of the three,Northern Leopard Frog being between 3/4 of an inch and 1 1/2 inches long. Their skin is smooth and greenish gray to brown. Dark stripes run through their eyes and along their bodies. The leopard and green frogs are most often seen along the shorelines where the tall emergent vegetation is interrupted, allowing for their access to the shore. They may also occur within the marsh where open water is present. Chorus frogs are more often heard than seen. These typically call from among the dead cattail stems from last year’s growth in the marsh, rather than along the lake. It is easiest to detect all of these frogs by learning and listening for the mating calls of the males. The leopard frog makes a low, guttural snore which lasts about 3 seconds. It may be followed by a clucking sound. The call of a green frog sounds like the twang of a loose banjo string. The chorus frog call sounds like a fingernail being run along the teeth of a comb and it lasts 1-2 seconds. Loss of natural upland habitat is one reason for low abundance or absence of frogs in this area. The 1918 Marsh is still an adequate breeding site, but frogs need both natural upland and wetland habitat to eke out a living. The one exception to this may be the green frog, which is a shoreline-dependent species. The green frog has the best opportunity for survival here because the shorelines are mostly natural in the Campus Natural Areas, and at least adults of this species do not need to venture far from water for their survival. In a truly natural area, juvenile green frogs move to the adjoining prairies or meadows to forage, presumably to avoid competition with adult green frogs. The small amount of suitable upland habitat may limit their numbers. In addition, frogs are sensitive to drought, especially during the mating season. Our dry spring in 2003 caused concern that frogs in our area would not survive and mate, but the late rains triggered a number of the early breeders to begin chorusing. Females who do not breed reabsorb their eggs. What is not known is how long females hold their eggs before beginning to reabsorb them. If they started to reabsorb their eggs before the rains came, then the males called in vain. The rains may have come early enough to allow some reproduction of the early spring breeders. This situation probably was not as critical for frogs in the CNA as it was in other areas, for there are more permanent water sources here than in many places. Still, dry conditions are detrimental to frogs, and populations may have been lowered due to recent droughts. In addition to habitat quality and water availability, frogs are also sensitive to water pollution because their eggs and tadpoles develop in shallow water. The CNA has a grant to address water quality issues in this increasingly urban watershed. Frogs eat insects and in turn are eaten by fish, birds, and mammals at various stages of frog development. When frog numbers are high, herons and egrets are sometimes attracted to the marsh. Next spring, go out and listen for these hidden songsters.